An starkly honest biography and an elegant romantic novel are among five titles short listed for the Cricket Society and MCC Cricket Book of the Year award for 2012. Fred Trueman: The Authorised Biography wins well deserved recognition for Chris Waters, cricket correspondent of the Yorkshire Post, who set about assessing the Yorkshire and England fast bowler’s life with the blessing and co-operation of family members yet managed to deliver an objective account that and does not always find in his subject’s favour. The judging panel headed by Vic Marks, the former Somerset and England player who followed Trueman into the Test Match Special commentary box at the end of his career, will announce their choice in the Long Room at Lord’s on April 16. The five contenders -- sifted from a field of 24 -- also include a nicely crafted biography of the former Warwickshire captain Frank Foster , a fascinating but ultimately tragic character who has a right to be seen as his county’s greatest player, in the opinion of author Robert Brooke. Foster, whose career was curtailed by the Great War and did not resume following a motorcycle accident in 1915, played in the Triangular Tournament that brought together England, South Africa and Australia in the Test series of 1912 and is the subject of Patrick Ferriday’s Before the Lights Went Out , which also impressed the panel enough to make the cut. The same period, subsequently recalled as cricket’s ‘golden age’, forms the backdrop to the work of fiction among the contenders, the novel Half of the Human Race by Anthony Quinn, whose unlikely imagined romance between a gentleman cricketer and a suffragette creates an evocative and insightful portrayal of a cosily complacent, conservative England -- of which cricket is a microcosm -- threatened by a revolution of unexpected origins. The quintet is completed by Australia - Story of a Cricket Country , a collection of essays and articles assembled by Christian Ryan -- whose biography of Kim Hughes, Golden Boy, was best cricket book at the British Sports Book Awards in 2010 -- to tell not only the history of Australia’s cricketing success but the way in which the game helped shape that country’s character. F.R.Foster: The Fields Were Sudden Bare , by Robert Brooke (ACS Publications). Before the Lights Went Out: The 1912 Triangular Tournament , by Patrick Ferriday (Von Krumm Publishing). Half of the Human Race , by Anthony Quinn (Jonathan Cape). Australia - Story of a Cricket Country , by Christian Ryan (Hardie Grant Books). Fred Trueman: The Authorised Biography , by Chris Waters (Aurum). Britain's Lost Cricket Grounds , by Chris Arnot (Aurum). The Cambridge Companion to Cricket , edited by Anthony Bateman and Jeffrey Hill (Cambridge University Press). A Class Act; Walter Read, The Surrey Champion , by Keith Booth (ACS). Cricket at the Crossroads: Class, Colour and Controversy from 1967 to 1977 , by Guy Fraser-Simpson (Elliott and Thompson). Higgy - Matches, Microphones, and MS , by Alastair Hignell (A&C Black). Australian Autopsy , by Jarrod Kimber (Pitch Publishing). Jack Hobbs: England's Greatest Cricketer , by Leo McInstry (Yellow Jersey Press). Not Out First Ball , by Roger Morgan-Grenville and Richard Perkins (Bikeshed Books). Twirlymen: The Unlikely History of Cricket's Greatest Spin Bowlers , by Amol Rajan (Yellow Jersey). The Last Flannelled Fool , by Michael Simkins (Ebury). The Following Game , by Jonathan Smith (Peridot Press). The Breaks are Off: My Autobiography , by Graeme Swann (Hodder & Stoughton). Tony Greig: A Reappraisal of English Cricket's Most Controversial Captain , by David Tossell (Pitch). Twentieth Century All-Rounder, by Clive van Ryneveld (Pretext Publishers). Arthur Milton: Last of the Double Internationals , by Mike Vockins (Methuen). Ian Botham: The Power and the Glory , by Simon Wilde (Simon & Schuster). Cricket and Broadcasting , by Jack Williams (Manchester University Press). Behind the Boundary: Cricket at a Crossroads , by Graeme Wright (A&C Black). Cricket's Historians , by Peter Wynne-Thomas (ACS). 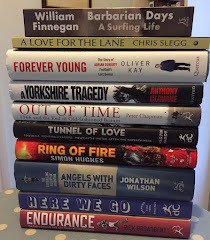 All 24 books were nominated by either Cricket Society or MCC Members and not publishers. Marks and fellow judges David Kynaston and Stephen Fay, representing MCC, and John Symons and Chris Finch, for The Cricket Society, will determine which takes home the £3,000 prize, won last year by Harry Pearson for Slipless in Settle.